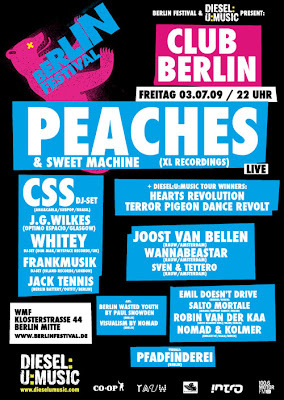 CLUB BERLIN mit: Peaches (live), CSS (DJ Set), Whitey, Frankmusik, Jack Tennis a.m.m. Omg, Berlin is going crazy. This week (Fashion Week) is so full of high class parties and bookings that you have to choose only a few, otherwise it will drive you totaly insane. Boys Noize, Peaches, Ladyhawk, Tiefschwarz, The Glimmers, DJ Hell, Shir Khan, Jazzanova...just to name a few. 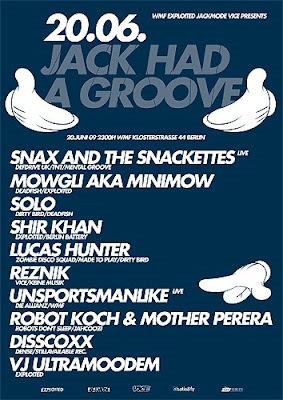 I play at the Club Berlin Party with Peaches (live with Sweet Machine), Shir Khan at the Levis Show with Boys Noize. Ah Yeah!!!! "In the beginning there was Jack, and Jack had a groove. And from this groove came the groove of all grooves." Dont worry - we didnt come to claim that this is your average house party. But there is something growling under the floorboards. As Lucas from ZDS said: "Gone are the multicoloured New Eras". In come the smart London boys...packed with low end bass tones, conga loops and african rhythms. "Jack had a Groove" presents the "New Wave" of upcoming house producers showcasing artists such as Mowgli&Solo or Lucas Hunter from Zombie Disco Squad. Mowgli runs the superb digital label Deadfish and currently released under his moniker of Minimow - Bollyhouse - on Exloited Records. Solo is his partner in crime who stepped into the arena with his "Congaloid"-single on Dirty Bird. Zombie Disco Squad are the latest signing on Made to Play and one of the most forward-thinking DJS I have met so far. As some people might have already noticed - I have been pushing this worldbeat-influenced housesound quite a lot in my weekly radioshow on Fritz. Make sure you check out the great minimix from ZDS for Annie Mac. I have included a link at the end of this post. To give the whole night a bit of a twist we have disco-boy Snax live on stage - with his band The Snackettes. Snax live is always a winner. No wonder he supported Jamie Lidell and The Scissor Sisters. Special Warmup by Reznik from Keine Musik Crew. Floor 2 is the more bleepy floor - fusing everything from IDM to Electronica, Dubstep, Crunk, Basement and Grime. Sasha Perera - singer from Jahcoozi - DJing alongside Robot Koch + debut liveshow from Unsportsmanlike (formerly known as Skate and support DJ for Moderat in the states). Viusual madness as always from Berlin Battery resident VJ Ultramoodem. DJ Supermarkt @ Low Club Madrid.... and then....holidays! hola amigos. I am having my last club-dj-sets until late summer, because i need a break. Come on you easyjetters and join me in Madrid's great Low Club. It's one of my few resident clubs, so... you will like it! Come and have an Altbier with me!